If you have a non-pillow top mattress or a two sided pillow top one, you can often extend the life and comfort of the mattress by periodically flipping it over and rotating it head to foot. This is a guide about remembering to flip or rotate your mattress. 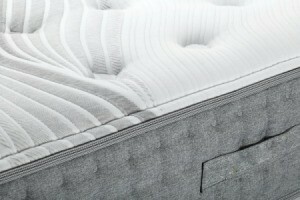 Everyone knows that rotating your mattress will keep it in better form. I usually try to do this every year when the time changes. That way I know it is done at least every 6 months. I always have a hard time remembering if I need to spin it or flip it over. I came up with my own solution to SPIN in the SPRING and FLIP in the FALL. It takes the guesswork out and hopefully my mattress will last longer. What I do is write ( I use a marker) on the foot end of the mattress when the next rotation is required. AKA April (I am not sure of the next time change month) will be written on the mattress so I know if I have rotated the mattress or not when April comes around. Ditto the other end of the mattress. Mark it November. When November comes around I will know it's time to rotate again and April will be showing at the end of the mattress. Which way did I flip my mattress last time? Place a safety pin on the bottom left corner, keep removing it and placing it at the bottom left corner every time you flip and turn the mattress. Rotate and flip your mattress flip counter clockwise, so you are assured that you are getting even wear and tear on that expensive mattress. I use the old saying "spin in the spring, flip in the fall". I do it on the equinox so it's marked on the calendar. Or you could do it on the daylight savings days. Either way, its a reminder.